The public consultation process will get underway tomorrow. 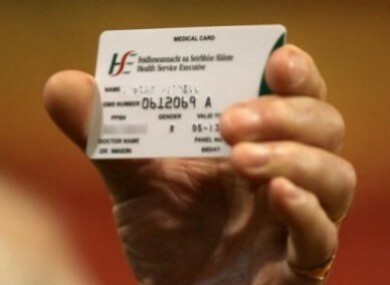 THE HSE HAVE announced that an expert panel have been appointed to examine how medical need should be taken into account when discretionary medical cards are being granted. The expert panel consists of 23 professionals from a wide range of medical disciplines. They will consider which medical conditions should automatically qualify for a medical card. Fine Gael Cork South Central TD and Chairman of the Oireachtas Health Committee Jerry Buttimer has welcomed the announcement. “The appointment of the expert panel is a very important step in changing the way discretionary medical cards are awarded. We are now moving to a system where, for the first time ever, medical cards can be awarded to people because they have a serious medical condition rather than just because they fall below an income threshold. “I am particularly pleased that the expert panel has been asked to take the views of patient advocacy groups into account”. The Our Children’s Health campaign group have been calling on the Government to amend the Health Act of 1970 so that any child diagnosed with a serious illness or congenital condition are automatically entitled to a full medical card. Under the current legislation the HSE can give a discretionary medical card to a family who have “undue financial hardship”. From January 2013 to April 2014, there was a 22 per cent drop in those considered eligible for a discretionary medical card. We must learn from the mistakes of the past and that is why I am also encouraging the public to make their views known as part of the public consultation process, which is getting underway tomorrow. Email “Expert group appointed to decide which conditions should automatically qualify for medical card”. Feedback on “Expert group appointed to decide which conditions should automatically qualify for medical card”.